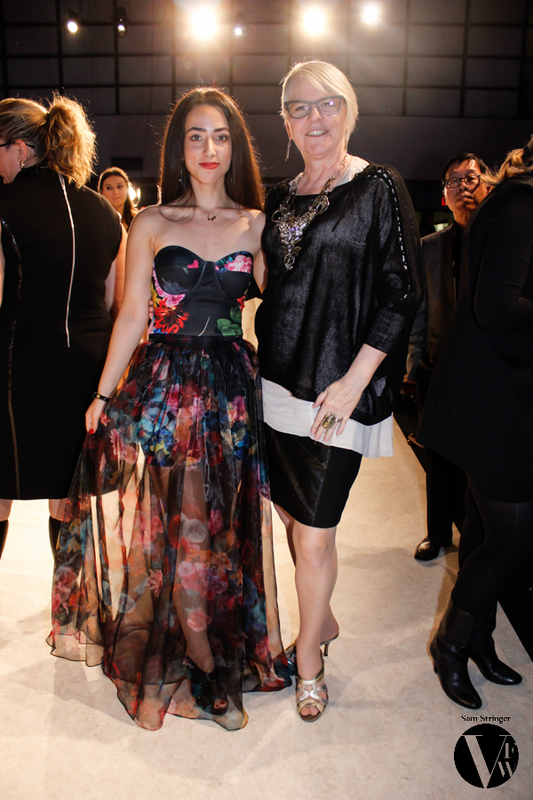 Friday at Vancouver Fashion Week (VFW) saw a packed house almost the entire afternoon/evening. Why? 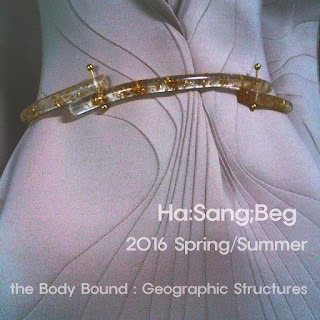 Just a great line-up of amazing shows including a two highly anticipated designers that have shown here many times - Green Embassy and Ha Sang Beg. They have garnered a large local following. A few new labels showing today also had large crowds of support in attendance, so seats were limited. I would like to mention another feature at VFW that is really worth checking out. There is a designer's showroom with different displays featured every day. Here you can get up close and personal with some of the garments you saw on the runway and talk to the artist who created the collections. If you would like to check it out, it's the room at the top of the lobby staircase on the RIGHT. Symone Says was back for her final night of emceeing and as always she rocked it - talking with audience members and handing out tickets to the after party. She pulled several handsome men from the audience and conducted an impromptu runway show that drew a great audience response. Of course, a woman's runway show followed. My outfit was from the JAC F/W 15 collection - a beige jersey top, a black knit/leather-look skirt and a black knit over top with laces at the shoulders. My fabulous necklace and large robot ring were from Vancouver based Carolyn Bruce Designs. Now on to today's shows. There has been a large number of white, black/white and black collections this season, but there are many great exceptions in full colour. I do not have the ability to cover all shows here, so I encourage you to check out the photos of other collections as they become available. Please note Green Embassy will be featured in a separate article so be sure and check back. Designer Vivienne Pash is Jamaican born, but now based in New York City. Her brand focuses on recreating 60’s luxury garments into youthful modern pieces. A graduate of the The Art Institute of New York, she worked as a freelance designer for a number of outsourcing companies in New York before launching her own label in 2008. This year the Vivienne Pash brand unveiled Pash Kidz, a contemporary line for boys and girls. I loved the comfortable silhouettes that let the textures and shapes stand out. The mix of woven, solid, sheer and mesh brought that extra element that made this collection pop in a subtle elegant way. Fabrics used include silk, jerseys, and cotton. The black mesh offered a hint of sparkle. This collection was versatile - including separates that could easily mix and match and dresses that could be fashioned into different looks with the addition of different styles of jewelry, yet stood easily on their own with no embellishment. I was very taken with this show in particular. As a former seamstress, the structural nature and beautiful tailoring caught my eye from the very start. Elegant, timeless and yet modern - not an easy thing to do. Then there were the wonderful handbags. Some were carried and some were slung over the shoulder, but then there were several that had been incorporated right into the coat design, threading through button holes or weaving around the silhouette. It was no surprise to discover independent Dutch designer Irma Borgsteede's previous career was as a fine artist and that she approaches every garment she designs as a piece of art. Collections are released as limited editions and are produced to order locally in Utrecht. Through her production label - ‘Fair Made in Holland’- she is working on a fair way to stimulate small productions and craftsmanship in the Netherlands, and by doing so offers an alternative to the bad circumstances in the low-wage-countries and mass-production garments. Looks incorporated wool and other natural fabrics, technical coatings and hand painting. The styling of this show was bang on. In talking with Borgsteede afterwards, I discovered that the beautiful hand bags incorporated into this collection were part of a collaboration with another Dutch designer - Dorrith Design. Dorrith shared, “In my designs, I’m always looking for a non-conventional way to give space to a bag by combining form, lines and detailing. I aim to create possibilities from flat to spatial, from 2D to 3D.” Dorrith's beautifully crafted handbags were a perfect fit with Borgsteede's garments. 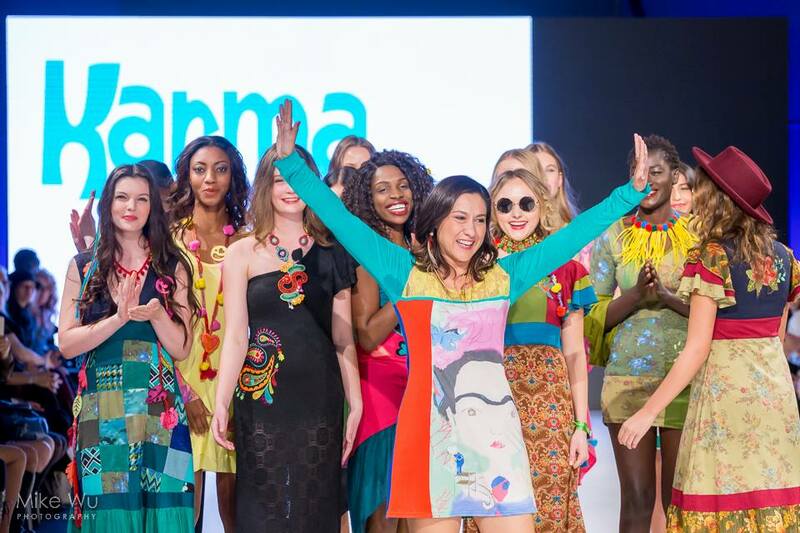 Kudos to both designers for not only such a stunning, seamless collaboration, but for bringing a great, live art show of your work to our humble runway! I just couldn't resist sharing this fun collection by the Mexican design duo of Monica Ruiz Pedroarena and Rosario Ruiz Pedroarena. Karma Love is a semi-artisanal brand that fuses a myriad of patterns with a vivid. colourful palette, embroidery and applique. The fit is designed to both accent the female figure and be comfortable to wear at the same time. Individual looks offered lots of texture and a wide variety of accents. I was told by one of the top U.S luxury shoe designers that in the end, fashion really should be about fun. It should make you happy. Karma Love brought the happy yesterday. The brand name is perfect for this 60's inspired colourful brand that gives a nod to that decade's carefree hippie culture. Who can forget the summer of love? Even the models were moving with the music and sporting ear-to-ear smiles. They obviously enjoyed being a part of this show and playfully showed off each garment. Korean designer Ha Sang Beg has showcased his collections on the runways at VFW many times - always receiving a loud and hearty reception. I have covered each and every one. What always makes his shows exceptional is that - unlike most designers who have an overall look for their label that continues from season to season - this designer starts fresh every time. Each collection stands on it's own, coming from a brand new place, with a brand new look. There are no repeats. This is not easy and a sign of just how deep the designer's creative well goes. You could look at his work like fine wine. Each season is distinctive and stands apart. Fans can look at a garment and immediately know when it was created. To this day, Ha Sang Beg is a bit of a mystery and he likes it that way. One day I am going to manage to get him alone for that one-on-one interview I've always wanted to do. Unfortunately this designer is often here and gone before I can get anything arranged. Hopefully next time I will manage to sit down with him, but for now it's enough to just enjoy his work. S/S 16 is titled, "The Body Bound: Geographic Structures." This is the most clean, tailored collection I have seen from him so far. It kept to a fairly simple palette of mostly Gold and Black which let the amazing structures, intricate design work and accent details stand out. The most striking visually was a top of woven gold shapes trimmed with black, but I was honestly bowled over by so many looks, I couldn't possibly pick a favourite. I think I'll just let the pictures tell the story this time. 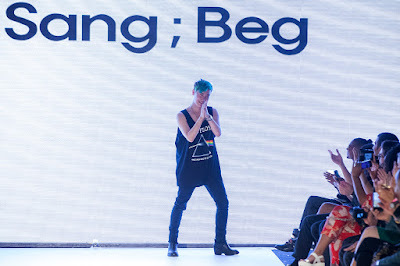 KUDOS Ha Sang Beg on bringing yet another fabulous collection to the Vancouver runway. AND - I'm still waiting for that interview!